It's so hard to be a general practitioner (GP) nowadays that two out of three doctors themselves recommend becoming a nurse practitioner instead. Indeed, a rising share of established GPs are leaving their private practices—due to falling salaries, plunging reimbursement rates, rising overhead, and mounting dissatisfaction with changes in their profession. GPs hardly have the time to run their own practices, let alone make farsighted decisions about how we spend our trillions of health care dollars. Yet while older doctors find this trade-off excruciating, Millennial practitioners are embracing safer group practices, where they can earn a salary and lead a regular life without too much overtime. In the short term, older doctors will go through growing pains as they adapt to the new reality of medicine. But the long-term outlook is bright: This paradigm shift toward group practice could usher in a new health care model entirely, where efficiency, produc­tivity, and doctor satisfaction all benefit. The amount America spends on health care is vast—as is the degree to which GPs direct how this money is used. U.S. health care spending was a staggering $2.9 trillion in 2013—almost 18 percent of GDP. Of that, a full 20 percent ($586 billion) is spent on phys­icians and clinical services themselves. And what's more, GPs are responsible for deter­mining through referrals and prescriptions where another 60 percent ($1.7 trillion) of this money goes. In the years to come, the economic role of these GPs will only grow, with over 15 million Americans entering the health care market by way of the ACA. Because that 20 percent is a large number, GPs are an easy first target of the trimming knife. But wasted health care dollars are a symptom of a broken "fee-for-service" model that emphasizes quantity over quality of care and offers little reward to GPs who exercise discretion. The current health care model places GPs on the front lines. But all signs point to a change: Many GPs are fleeing their independent practices for group practice—or even retirement. The Association of American Medical Col­leges, by measuring doctors per patient, estimates that we will have a doctor shortage of 130,600 by 2025, more than half of which will be among GPs. The biggest driver of this GP deficit is economic. General practice is just not as lucrative as it once was: In 1970, the average inflation-adjusted income of GPs was $185,000. In 2010, it was just $161,000. To stay in practice, many independent GPs are enacting cost-cutting measures, rejecting those covered by Medicaid, Medicare, and even private insurance companies. Overhead is also on the rise due to rising liability insur­ance and time-consuming paperwork. And the newest hurdle for doctors comes in the form of electronic health records (EHRs). Though these systems help with coordinated care, they're costly and time-consuming to implement, meaning that only big hospital systems reap their benefits. Practices have an interesting choice to make: Adopt the system or pay the fine. As a result of this financial stress, many GPs are at their breaking point. A 2012 Mayo Clinic survey of more than 7,200 doctors found that almost half had at least one symptom of burnout, up from 10 years ago when only a quarter said the same. And among all doctors, GPs were most at risk. This helps explain why 30 percent of GPs ages 35 to 49—and 52 percent of those age 50 and over—plan to leave their independent practices within five years. Of those who plan to leave, many older practitioners are simply retiring. Many others, however, are joining "hospital systems." As recently as 2005, nearly 7-in-10 med­ical practices were privately-owned, but that share has dropped to just 4-in-10 today. Under this group construct, practices are bought up by a hospital system, giving doctors access to greater efficiencies of scale. They essentially switch from "employer" to "employee" on the promise of higher salaries, less overhead, and more control over their hours. Another benefit is clout with insurers: Hospital systems negotiate and team up with insurers on doctors' behalf, saving them time and money. A generational divide among practitioners has augmented the shift away from pri­mary care. Medicine, once a vocation attracting only the most dedicated, is now "just a job" for today's young doctors. Just look at medical residency, which has transformed from a career phase in which young Boomers were once forced to work for days on end with little sleep, to a highly protected apprenticeship where young Millennial residents are given mandatory time off. This shift appeals to today's new practitioners: Young doctors sur­veyed by Merritt Hawkins, a top doctor recruiting firm, listed quality of life well above finances as their top requirement when job-searching. And they'd rather join a hospital system and earn a consistent paycheck than open their own practice, where a fixed salary is not a given. Merritt Hawkins says that 51 percent of the positions they filled from 2009 to 2010 were for hospitals, up from 14 percent eight years prior. This generational shift is accelerating a pre-existing trend: New doctors are becom­ing specialists rather than GPs. Only an estimated 25 percent of new physicians end up in primary care. The biggest driver is the paycheck: At a time when the average medical stu­dent graduates with debt exceeding $165,000, the rising income of specialists has become a top attraction. From oncologists to plastic surgeons, specialists have capitalized on technological advances in their fields, and have become masters at monetizing their services. All of this is great news for hospital systems, which unlike independent practices can afford to experiment with "managed care." In this model, patients pay a fixed monthly fee instead of paying for individual treatments (also known as "capitation"). The first entry into managed care was the HMO, which enjoyed a boom in popularity around the 1990s before antitrust laws and public backlash temporarily silenced its advocates. But the time may be right for a rebound. A shift toward group practice would make this setup easier than ever before. Indeed, HMOs still cover roughly one-quarter of the total insured pop­ulation—and new models of managed care, such as accountable care organizations (ACOs) and concierge medicine models, are emerging to fill the gaps. This points to a future in which managed care may become the norm. Millennial doctors get stability, while young patients can mitigate risk with a flat monthly payment. While HMOs still provide the majority of managed care, the alternative options are rising fast. ACOs like Qliance—which already has a patient base 35,000 strong—could soon become a viable mainstream option. With this format, doctors could spend time treating patients instead of filing paperwork—and would have financial incentive to improve patients' health. It would trim the fat from the health care system while providing real benefits to all those involved. Expect the health care system to tilt further toward group practices and managed care. With their salaries falling and overhead rising, general practitioners—the backbone of the health care system—are fleeing their practices just as they're needed most to provide care to newly insured Ameri­cans. This trend is being acceler­ated by a new wave of young doctors who increasingly view medicine as "just a job" rather than a calling. To stay in business, many GPs are teaming up and joining hospital systems, making a large-scale move away from the fee-for-service model possible. Know the winners and losers of a shift to managed care. Managed care makes quick and easy access to medical records essential—meaning that EHR providers (mainly the six largest ones) will be the biggest bene­ficiaries of this shift. 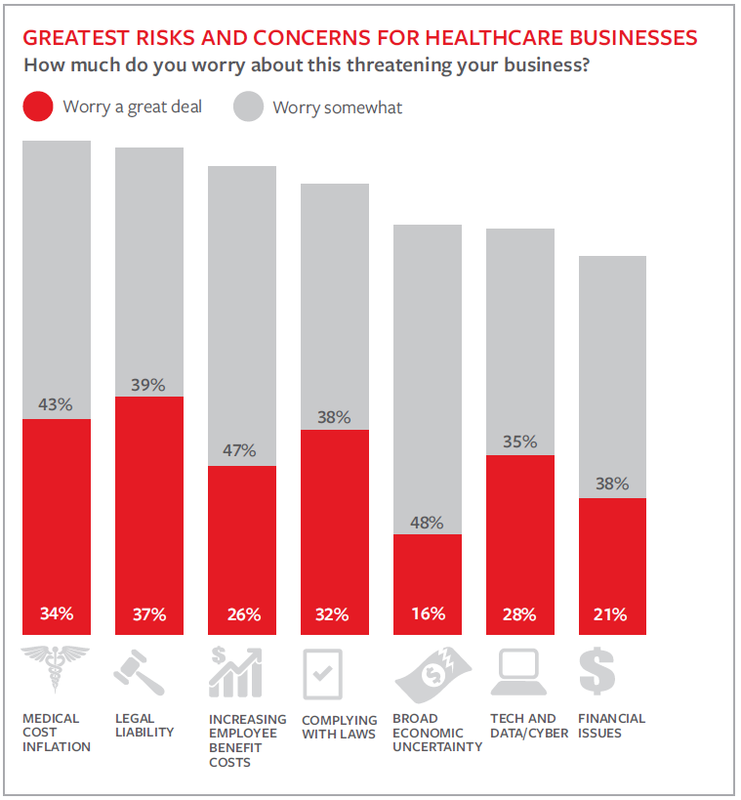 And because health care has the highest percentage of outside data breaches of any industry surveyed, data security will also be a huge growth area. On the product side, tight hospital margins will enable larger group practices to use their bargaining clout to reduce prices and the number of medical equipment manufacturers. This will hit specialty shops—who have traditionally provided sup­plies and equipment at very high margins under the fee-for-service model—particularly hard. Keep in mind that the structure of the health insurance landscape is shifting rapidly. In 2015, two-thirds of employers will update insurance offerings due to the ACA, doing everything from increasing deductibles to offering health bonuses—not to mention the share that will be cutting part-time hours. To be sure, the predominant insurance option in the near future will still be the PPO (currently at 58 percent employee enroll­ment), with growth coming mainly in the "consumer-directed," high-deductible area. At the same time, certain subsections of managed care are swelling. The number of ACOs, now at 606, surged by 25 percent in 2013, making companies such as Qliance and HealthCare Partners a safe bet. Realize that the ACA will eventually ramp up the growth of health care spending. Health care spending growth has decelerated since the ACA's introduction. However, most economists attribute this trend mainly to the recession rather than the ACA. (White House num­bers confirm this.) But health care spending shows strong signs of picking up. In Q3 and Q4 of 2014, health care added 0.5 percent to the annual GDP growth rate, due largely to ACA coverage expan­sions that will only increase. And Medicaid spending growth acceler­ated in 2013 to 6.1 percent. (Compare this to Medicare's growth rate decline.) In fact, the Centers for Medicare and Medicaid Services soon expect health care spend­ing growth to again outpace economic growth.